1. 24 Hour Thermogenics Choco Lettes (Health Management Care/Diet Center) bears an unauthorized “OU-P” logo. It is not certified by the Orthodox Union, and is not “Kosher for Passover.” Corrective measures are being implemented. Consumers who see this product should please call KASHRUS at 718-336-8544. 2. Ben-David Winery, based in Moshav Sdei Eliezer, is using the “OK” symbol on bottles of Merlot 2008 (a dry red wine) without authorization. The label states “OK-P” (Kosher for Passover), but, in actuality, the wine has a regular non-mehadrin supervision and is the product of heter mechira grapes. 3. Chevrusa, a sweet wine, supposedly produced by I.G. Sharp Beverages and Wines, bears an unauthorized claim to be “Kosher L'Mehadrin for Passover by the Rabbinate of Haifa.” It is not certified by the Rabbinate. 4. Paskesz Fruito’s, certified “Kosher For Passover” by Rabbi Benyamin Gruber, mistakenly lists “cochineal color”. There is none in the product. The label has been corrected for this year. Consumers who see this product listing “cochineal color” should please call KASHRUS at 718-336-8544. 5. FMV Brand Semi Sweet Chocolate Chips (12 oz.) were mistakenly labeled “OK-P”. They are kosher and pareve for year-round use, but NOT for Pesach. This product is from a previous year, but it may still be on sale. 6. Great Value brand Confectioner’s Sugar sold by Wal-Mart is mistakenly labeled as being “Kosher for Passover.” The product, although certified kosher for year-round use by United Mehadrin, is NOT certified for Passover use. At our first course, the group was made up of a mix of mashgichim, rabbonim, businessmen and kollel men. Throughout the training course, they were learning about and personally discovering which insects infest which vegetable as well as how to spot them. In the March issue, we discussed the infestation issues with strawberries and the inability to render them insect-free by washing. We also explained the procedure for the “shmate bedikah” method of checking that is used at Pos’tiv and which is taught by Rabbi Moshe Vaye, shlita, the world renowned expert on insect infestation and the author of three books on the topic (“Bedikas Hamozone Cahalocho”). We left off last issue with a promise to discuss next the leaf-miner fly. The leaf-miner fly is a tricky little insect that develops and is found inside the leaves of lettuce and inside celery, scallions and many other vegetables. Anyone interested in last issue’s article can email their request to kashrus@aol.com. After explaining that romaine lettuce has a leaf-miner problem, Rabbi Goldstein reached for the pile of scallions on the table. He opened several bunches and gave one scallion to each participant. He told the group that “every single one of these scallions has a live leaf-miner.” Some people in our group started to shake the scallion in the hope that the leaf-miner would fall out; none did. Rabbi Goldstein explained that, even if you were to take a leaf of romaine lettuce or a celery stalk or a scallion, and shake it, wash it and scrub it, you cannot remove the leaf-miners from the vegetable. Then one of the group asked, “Are you saying that even scrubbing the romaine lettuce very well with a brush won’t remove the leaf-miners from the romaine?” Rabbi Goldstein answered that even scrubbing well with a brush cannot remove the leaf-miners from the romaine lettuce or any other vegetables. Each person in the group sat there perplexed while looking at the scallion he was holding in his hand, wondering why the leaf-miner would not fall off. After a brief moment of silence, Rabbi Goldstein continued to speak: “Let me explain to you just what a leaf-miner is, and how it operates. “The leaf-miner insect has a very interesting and unique life cycle. It starts its life as an egg from a fly. This fly is from the family Agromyzidae. There are between 2,000-3,000 known species of this insect, but, only 100-200 actually do damage to crops. “Within a few days after the leaf-miner fly deposits its eggs inside the leaf of the vegetable, the eggs start to hatch. Once hatched, the leaf-miner develops a unique organ called a mouth hook. This mouth hook is an organ that looks like a stick with two pointy teeth that the leaf-miner swings from side to side and is used to chisel a tunnel through the leaf tissue. “The tunnel is chiseled beneath the surface of the romaine lettuce leaf or other vegetable leaf, while feeding on the chiseled tissue and leaving its feces behind. When you look at a leaf, you can actually see the leaf-miner trail inside the leaf. The dark colored spots along the trail is what the leaf-miner has left behind. “In its brief stay on this earth, the leaf-miner fly goes through four stages. The first is the egg stage. The second is the larva stage, during which it creates a mine and feeds (hence its name leaf-miner). The third is the pupa stage, during which it transforms from the larva to the fourth stage of being an adult leaf-miner fly. Rabbi Goldstein explained to the group that sometimes it is very easy to identify and some-times its very hard to identify these leaf-miner trails. Sometimes the leaf-miner trail is very long and clearly defined, yet sometimes it is very small and hard to see. Many times the leaf-miner trail can be as thin as a piece of fine hair or fine thread. A properly trained mashgiach can easily identify these trails. The leaf-miner digs into the romaine lettuce, so even if you try to wash or brush it off, it will not leave. It is permanently imbedded beneath the surface of the leaf. While this insect cannot be found on the surface of the leaf, we are fortunate that his manner of boring leaves a clearly visible trail. Usually, you will find the insect at one end or the other of the trail, but sometimes it has already exited. In any event, it is advisable to throw away the whole leaf and not to eat it, as will be explained further on. I asked Rabbi Goldstein on which produce does he find a leaf-miner problem. He answered that leaf-miners can be found in romaine lettuce, celery, scallions, basil, parsley, spinach, dill, chives, and in all other kinds of leafy vegetables as well as many types of herbs - a very wide range of produce indeed. One participant asked, “If washing doesn’t help, then how does Pos’tiv Produce deal with the leaf-miner problem.” Rabbi Goldstein answered, “Very simple. Pos’tiv Produce has constructed specialized, custom-made greenhouses that are designed with certain features which prevent leaf-miners from entering. There also are certain innovations and techniques that are implemented and incorporated into the Pos’tiv Produce system. In any event, even though the Pos’tiv Produce system prevents the leaf-minor infestation, the Pos’tiv Produce protocol is still to check for leaf-miners. The State has publicly claimed that this was a budgetary response to the economic situation. At the very same time, journalists were told that the real reason the state acted to disband Kosher Law Enforcement was to avoid the legal challenges the state has had over their role of protecting kosher. The former kosher inspectors all belonged to a union and recently have filed a grievance against the state. The union feels that this grievance has merit and is pursuing various avenues to bring this issue to a meeting and hopefully to reinstatement for the inspectors, or at least for some. What appears further on is the actual wording of the grievance. As you will see, the union accepts that these men are better prepared to do the job of securing our food as kosher than are the safety workers who lack any real understanding or concern for kosher. Noteworthy are these words: “All eleven of the kosher food inspectors are observant Jews who have developed expertise, through both their personal Jewish educations and their experience as inspectors. To assign these functions to other food inspectors who are not experts in this matter makes it impossible for the law to be enforced. I have made extensive efforts privately on behalf of these eleven, men of fine character who have worked tirelessly to help us all be protected from innocent error as well as unscrupulous behavior. And for many years I have attempted to strengthen the powers of the Kosher Law Enforcement Bureau and to support Rabbi Weiss’s efforts on its behalf. Still, I find very few organizations ready to assist in convincing the governor that we need kosher law enforcement to maintain a basic kosher standard. When you read this article contact the office of Governor Andrew Cuomo in Albany to demand that these men be reinstated doing their job for all New Yorkers. This Pesach is one year closer to Mashiach and for that we are truly happy; but, it is also one more year removed from our leaving Egypt and our receiving the Torah, and for that each Jew should pause and reflect. I relearn daily how far most people are from understanding kashrus and our responsibility to ensure that “mistakes” do not occur. I speak to many hundreds of people each year about kashrus and try to help them understand. Some do, but many sadly miss out on the opportunity to take responsibility for their kashrus observance. This is especially unfortunate at Pesach time. Rabbi Shimon Eider, zt”l, (to whose memory the Consumer Alert section of each KASHRUS Magazine is dedicated — see note in the box on page 59) each and every year would review his detailed Guide for Pesach, admonishing us all to avoid such and such, no matter whose hashgacha was on it, to seek out a “very reliable” hashgacha for a particular food, and to use certain foods with no Passover designation at all. And we continue the service. Each year our staff researches anew every entry in the Pesach Consumer Alert section — now 103 entries spanning 16 pages. We contact the kosher certifiers, whether they are here or in Israel, as well as the companies which are mentioned. Sure you can go into the stores and see what is there, but now you are forewarned. That is why you buy this magazine; and because you do, that is why we perform this due diligence on your behalf. Thank you for your trust. Plenty is changing in the kosher world and is every day. As an example of how people are taking the infestation of fish seriously, I’ll tell you about the supermarket I visited today - one completed certified as kosher. The manager shared with me that certain fish are not being sold in his store any more due to the anisakis problem. In the back of the supermarket I observed the mashgiach removing worms from halibut. He also does the same for flounder and wild salmon, etc. An impressive operation. There are very few like it anywhere. Health is an area which we are examining more and more. Maybe we will never elevate the ethical standard of the owners of food companies — a highly challenging endeavor at best — but we can and we should impact on the safety and healthfulness of kosher food products being sold to us. 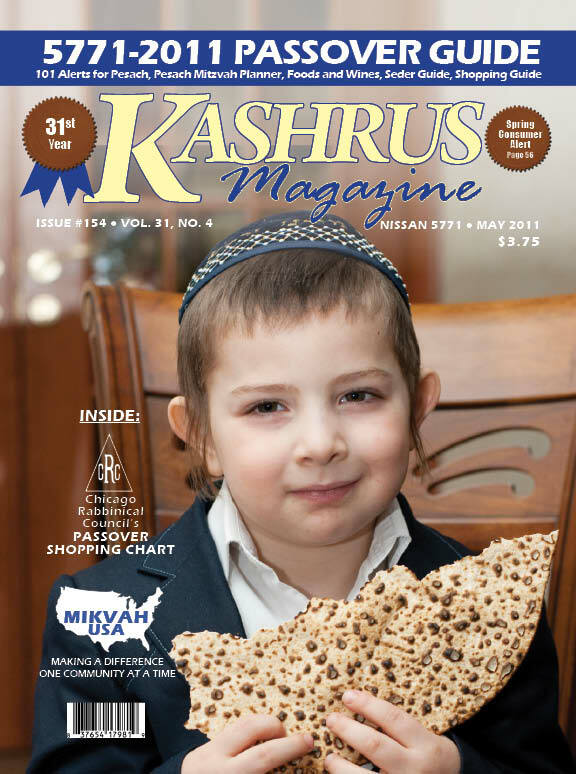 In this issue, we feature the words of David Frost (p.70), who points to KASHRUS readers the need for kosher certifiers and merchants to step up to the plate and make that Kiddush Hashem that we all want them to. Imagine what response there would be if the entire world observed that kosher manufacturers, merchants and rabbinical overseers were highly concerned with the safety of their products. That would be a major Kiddush Hashem. We are also printing an article by Rabbi Eliyahu Kirsh (p.72), a former talmid at Yeshiva Birkas Reuven. Rabbi Kirsh describes two ways to appreciate the laws of kashrus. One of them is directed to the health benefits awaiting he/she who takes heed. Take a look at the personal odyssey of an incarcerated Jew, Clinton Belch (p.84). It is a moving documentary. I penned a piece on “The Kosher Eleven” (p.80), 11 men who protected us in their work for NYS Kosher Law Enforcement, which department basically died due to lack of sufficient interest on the part of the Jewish community. We are proud to be involved with our vegetable inspection training at Pos’tiv. Not a day goes by that we do not see the impact this program is having. Join us right after Pesach (May 2, 5, 18) on our trips (call 718-336-8544) or at least purchase a jeweler’s loupe for use in your own house (see page 83). On page 86 we give you much needed information about the leaf-miner which is easy to spot once you’ve read the article. Yad Eliezer, Kupat Ha’ir, and Mikva USA are three very important groups working for our people. Your donations will help them reach even more people with their services. Use Mikvah USA’s envelope in this issue to reach them and contact the others by phone, mail or email.